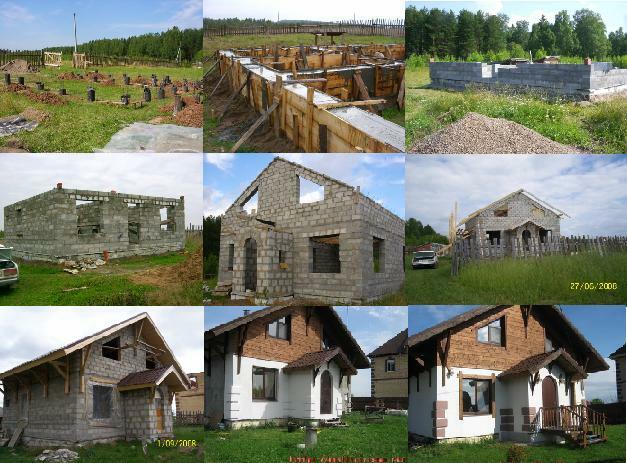 The construction of your own home, the problem, which seems almost unrealizable dream than a distant and unrealizable. But the thought of owning your own home, the desire to be the "master", lives in the heart of every self-respecting man, a real man. The author of this site, when, long ago, thinking about the same as thinking distinguished visitor who reads these lines of his own house, visiting relatives in a small cottage, having tasted the delights of peace and comfort of living in his house, he decided for himself once and for all : home to be, and I'm sure in their desires, rushed into the vastness of the worldwide network to find answers to urgent questions like? After six months of readings of various books on construction sites, forums on the topic of construction, in the process of absorption of information began to emerge overall vision of the construction projects at home, started the choice of information is really meaningful and useful, rather than simply copying information from primary sources and the issuance of the "own creation" . Pages are placed in chronological order, the beginning of construction - the purchase of land in 2004. Be sure to visit all the pages, you may find yourself looking for something that came to my humble site dedicated to building your own home. In the "News RSS ", is RSS feeds you can subscribe to receive the latest changes to the site. Bolder subscribe to RSS news, they will always keep you informed of updates on the site, RSS can be viewed in the browser Opera, or IE from version 7. In the "Sponsors", (well, a bit on the site, I'm not abusing this case) is advertising (as well without it), it can pay for domain and hosting, as well as compensate authors for the cost of internet access, personal time on questions from visitors its location provides support and future update of the site. Red links are not open yet, but will be filled in the future. For ads on our Web site we use third-party advertising companies. These companies may use information (not including your name, address, email address or telephone number) about your visits to this website and other websites in order to provide advertisements about goods and services. To learn more about these practices and your choices about not of this information, click here. Thank you for your attention.